Not only does this have the shiniest book cover I've seen outside of Guinness's relentless record books (holographic! How whizzy), but this is one of the most enjoyable Neil Gaiman books I've read in ages. A friend was looking for suggestions for where to get started, and actually, this is perfect. Gaiman's books for children have all the inventiveness, humour and sheer balls-out imagination as his books for adults, they're just 100% demented fun, too. I went to see him reading this last week, with support from assorted chums including Mitch Benn and Lenny Henry voicing a pirates, aliens, wumpires (definitely wumpires), dinosaurs and alarmingly intelligent pink ponies. It's a wonderful story, basically a dad popping out to the shop to get some milk for his children's breakfast, taking quite a while, and then telling his tall tale to two extremely suspicious and unimpressed children. 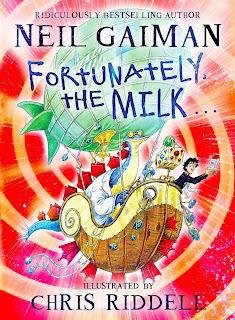 The milk survives each disaster and twist thrown at it, hence the refrain "Fortunately, the milk..."
It's inspired by Gaiman drawing up a list of books with positive portrayals of dads, and getting stuck after Danny, Champion of the World - which if you haven't read in a while is so worth digging out of the library. This is also beautifully illustrated by Chris Riddell, and if your brain is feeling a bit staid and stuck, this is the perfect way to loosen it up and have a glorious laugh at the same time. Marvellous. This also comes with a Gaiman twist, that being that a reliable source told me his The Graveyard Book was strongly influenced by The Jungle Book - and as I read that sentence back I'm already going "ah" - and as I'm planning to read that one again soon, I thought this would be good prep. Also, this is one of those books I *think* I read as a kid, but I may just have thumbed through it and gone back to the Disney version. How can this possibly only be 3/5? Well, three is good. Fine. But while I really enjoyed the stories about Mowgli, Kaa and the wolves, as well as a stand-out one about a mongoose called Rikki Tikki who starts a war against some extremely awful cobras, Kipling wrote very average poems for this and there's one at the end of each story. Kipling is on very strong ground with the Mowgli stories, which are just fantastic: totally believable despite every animal in the jungle speaking as though they're auditioning for the RSC, and gorgeous imagery that takes you right to the heart of it. Some of the others fit quite strangely - seals? A story about seals? - the elephant kid Little Toomai needs a visit from Supernanny, and the merry comments about white people being superior to brown and black were reminders that Kipling and his era could be massive dicks. I got a fantastically cheapo edition for £2.50, published by Collins, which comes with a handy introduction saying "please don't get upset by how racist it all seems, that's just how it was and we can't compare it to now", but also pointing out that Kipling was living in Vermont when he wrote these stories, hence the story about seals and the rather boring final one about military animals. I'm glad I read it, but only because I now appreciate The Just So Stories more than ever. OOH, I was at the reading too! It was so much fun, the live sketching was fantastic. 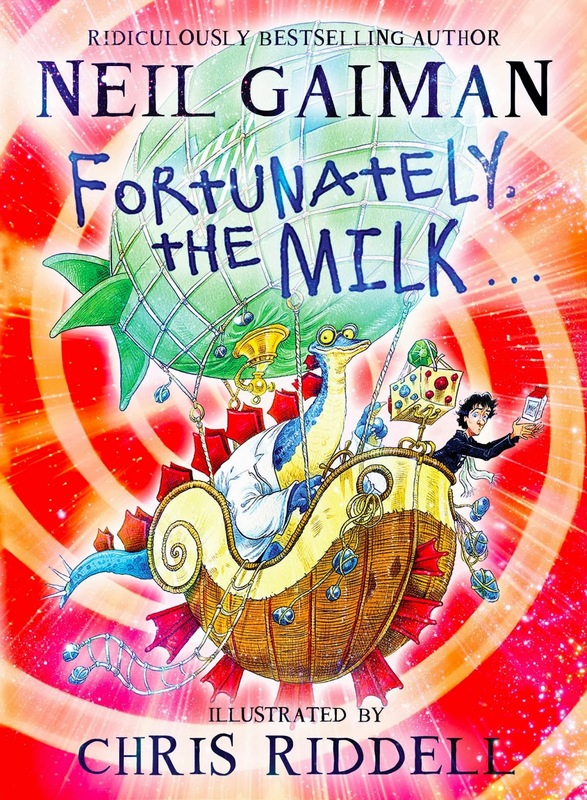 Both my kids have just read "Fortunately, The Milk..." and both totally love it. Planning to slip the ten year old "The Graveyard Book" and see how he likes it. I, too, was at the reading, it was brilliant! It was also an introduction of my partner to the awesomeness of Neil Gaiman ... we came out grinning like five-year-old children!